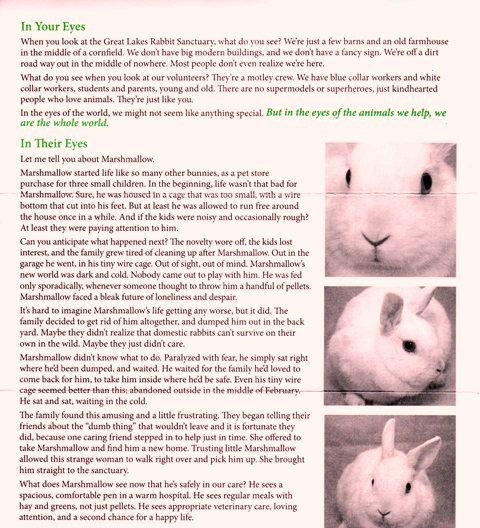 "Below is a true story about a bunny named Marshmallow. Like Marshmallow, Hannah and I were Easter bunnies that people no longer wanted. 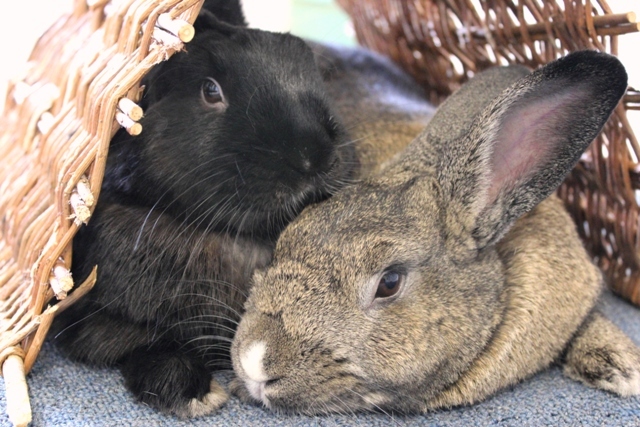 Luckily we were taken in by a rescue lady and Mama was able to find us and bring us to Bunnyville. 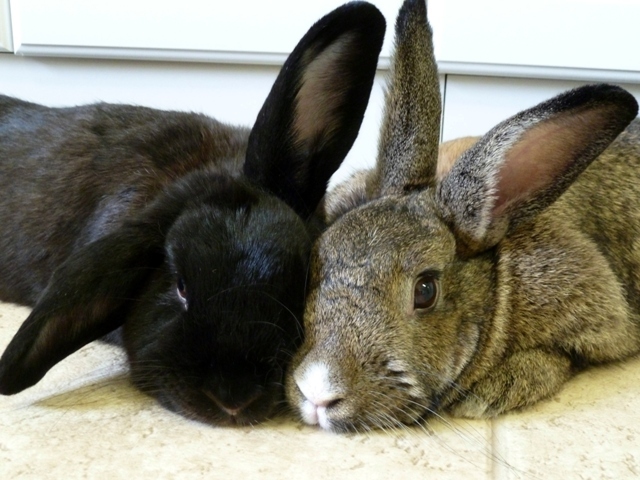 All of mama's bunnies were living in the homeless shelter when she adopted them." 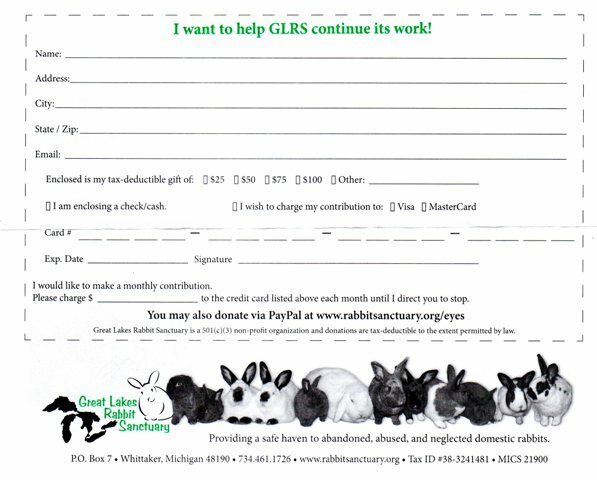 "From the purchases you make in our SHOP, Mama donates money every single month to The Great Lakes Rabbit Sanctuary to help other bunnies that are waiting for loving families. Thank you soooooooo much!" 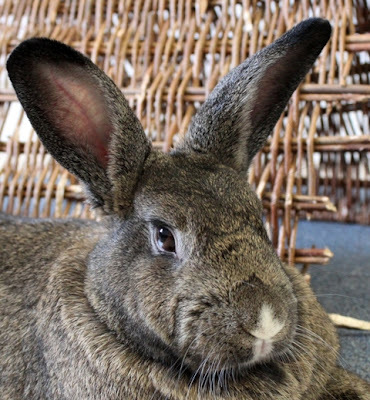 "Our Easter wish is for more of our bunny friends, in the homeless shelters, to find their forever homes with kind and loving people. Homes were there is a nice place to sleep and play, lots of proper food and companionship. Bunnies are an 8 - 12 year committment. Hannah and I were ready for the committment and so happy Mama adopted us." 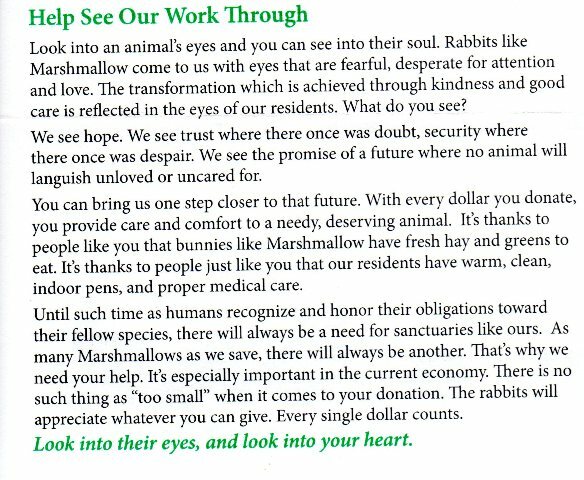 "We love you and thank you very much for helping Mama support our friends in the homeless shelter. Oh and the nice lady that took care of us before Mama came? Well, Mama supports her rescue too!" "Whoa!!! Check out all those pressies Mama got for her birthday!" "From Auntie Jade and Cousin Mickey came this necklace designed by Donna Swan of Lavender Rabbit Studio. Mama sat down on the floor and cried when she opened this and saw charms of all her bunnies and cousin Mickey." "There is even a bracelet! Auntie Jade commissioned Donna to create these especially for Mama. She loves them! 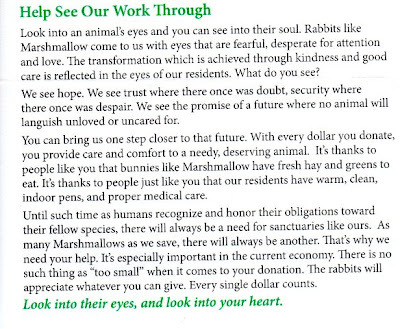 Such a wonderful keepsake of all us bunnies." "Grammy Sylvia (no blog) sent these Arthur Court pieces. Mama has started collecting Arthur Court bunny stuff. She likes the fact that a portion of sales from products funds wildlife preservation and protection as well as environmental research and eduction. Cool huh?" 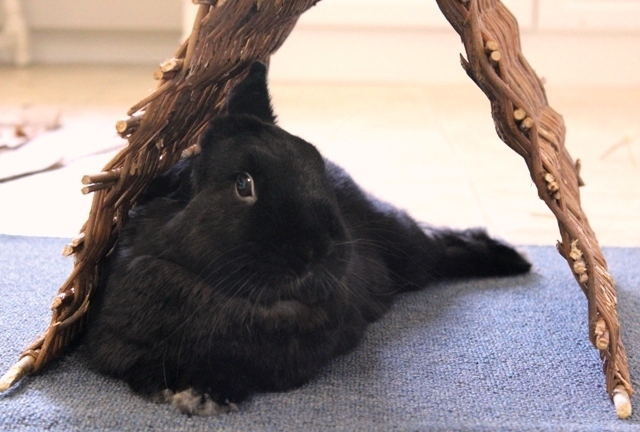 "From Auntie Shawn (no blog) who is also our bunny sitter came this cute boy. The only plant Mama can grow is ivy. She's had an ivy plant on the back porch for two years and she's so proud of herself for not killing it! Papa get's all the credit for our yard looking so pretty." 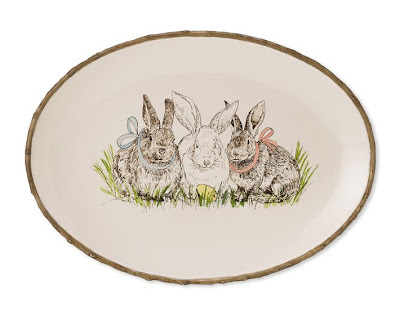 "From Auntie Lydia came this platter from Williams-Sonoma. Auntie Lydia is also made the cheesecake (that is all gone) and a CD of fun dance music. Mama likes to drive with happy, fun music playing in the bunnymobile. She does a lot of 'car dancing.' Dorkwad! She and Mama spent all day Wednesday in Wilmington, NC having lots of fun!" 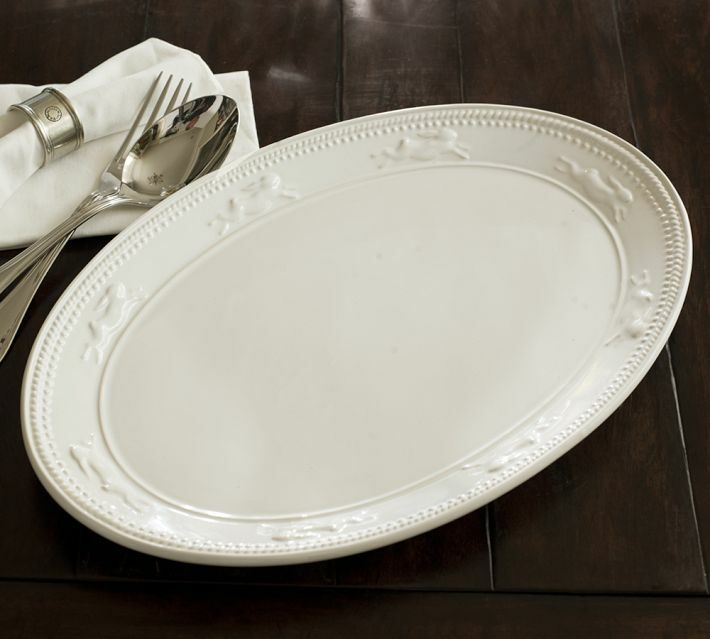 "From the book/dinner club girls came this platter from Pottery Barn. I think it's time for a party so we can use those platters! I see them loaded with veggies! Woo hoo!" "From our friend, Susanne in Denmark, (no blog) came all these wonderful things! Susanne and her family came to meet us last Summer. Mama wishes they lived closer. We would have lots of fun plus her girls just loved us!" "From our good friend, Christine of MacDonalds Patch in Australia. She said every time she see's something with a bunny she thinks of Mama. We love that we have so many friends all over the world!" "Captain sent Mama a box of goodies too, but she won't let Mama open it until this Wednesday. Captain is coming home for a visit. Mama can't hardly wait to see her! Next March Captain will retire from the Navy and be home for good. Mama said that will be the bestest pressie ever!" "Boy oh boy, somebunny sure was SPOILED! In case you're wondering, Papa got Mama a bunch of Summer clothes that she needed and a new Starbucks cup for her collection." "Mama sends her sincere and heartfelt thanks to all of you that took the time to leave a birthday comment. Friends make life so fun! She loves you to the moon and back!" "Now I think she needs to get back to work on her book and new designs. She's been such a party animal this week!" If you've been following my blog for a while, you know that I feel like every day is a reason to celebrate! There are sooooooooooo many things in life worth celebrating! Well today I'm celebrating just a little bit more as today is my 44th birthday! At 6:30 this morning, I got a special delivery from my friend, Lydia. She makes the most wonderful cheesecakes (which happen to be my favorite) and she made me my very own personal lemon/white chocolate cheesecake! Her husband, John, dropped it off on his way to work. The little bunny on top was playing happy birthday and John sang! What a totally fun way to start my day! Ummm yes, parts of the cheesecake are now missing! I love birthday's and I'm never afraid to say my age. I'm proud of my age and celebrate every wrinkle and laugh line as time well spent. Besides, I'll always be 21 on the inside. hee,hee,hee. So much has changed in my life over the past few years. It took me a long time to realize that if I wanted my life to be different then I had to be the one to change it. We all have that power within us. The photo above is the view right now from my bathroom window. I loved the colors of the grass, the tree and the sky together. It has inspired a new pattern. Stay tuned. I bought this print from Mary Engelbreit awhile back. This saying has been stuck in my head for years. Now hanging beside the print are my new wool applique pieces. I always wanted to be my own boss, own my own business, design quilting and stitching patterns and teach them to friends near and far. Now with my Shop and my blog, I'm doing just that. Sharing my designs with you brings me so much happiness! HAPPY! Like wearing blue jeans and cowgirl boots! hee,hee,hee. Oh and like this necklace I just had to have! This necklace was made by my friend Sherri of Sherri's Jubilee! Sea glass! Cool huh! She's got some gorgeous pieces so hop over and visit her! 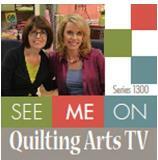 It's hard to believe it was a month ago I was at the Mid Atlantic Quilt Festival! Boy is this year racing by at full speed! Here are the final quilts on the tour. Enjoy! "Sea Mates" made by Cathy Wiggins of Macon, NC. This weeks critter quilt is "Caught in the Act" by Barbara McKie of Lyme, Ct.
"The Jennings Homestead" by the Milwaukee Art Quilters in Wauwatosa, WI. "Vintage Button Boquet" by Linda M Roy of Knoxville, TN. This quilt won best of show and looking at all that hand quilting and detail you can see why! Incredible! "A time between times" by Sara Madson of Suffolk, VA.
For you art quilters out there is "Within...Dimensions" by Catherine Etter of the Colonial Piecemakers Guild. "The Gilded Age" by Nancy L. Hovis of Lewes, DE. Love all the stitchery in this quilt! There are over 2000 Swarovski Crystals in this quilt! Look at all that quilting! Whew! And finally, a quilt for my friend, RG. Thought you might like the dragon. :) This quilt is called "William and Tony's Magical World" by Kristin Vierra of Lincoln, NE. 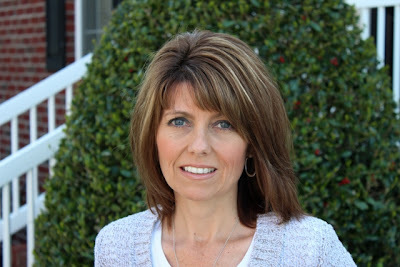 In closing I want to share this link with you that was shared with me by my friend, Judy in NC. Recently, Karen Combs, a traveling quilt teacher, lost all her quilts when her car was broken into. I'm sure the person that stole the box was disappointed to find quilts! Here's the link and the story. Pass the word along. As quilter's we all know how heart breaking this would be. As a traveling quilt teacher, I also know what a horrible inmpact this would have on my business. Head, shoulder's, nose and toes! "Oh how embarrassing! I can't believe she did this Hannah." "Harrington, you know Mama is a total dorkwad!" Work'in on it Wednesday - A new Pattern! Hellooooooooo! Happy Spring or Autumn to all my Aussie girlfriends! Spring and Autumn are my most favorite times of year. Winter is too cold and Summer is too hot. Spring and Autumn are juuuust right! Hmmm...sounds like Goldilocks and the 3 Bears. hee,hee,hee. I've been ready for Spring since the day after Christmas! Why you ask? Well, my mom has a real talent for making wreaths (and for writing poetry). So for Christmas this past year I asked if she would make me a Spring wreath. This is the wreath she made me! Thanks mom! I love it! It's been hanging on my front porch since January 2! See, I told ya I was ready for Spring! A while back I showed you these wool applique's I was working on. They were so fun to make and so easy! What I didn't show you was the Stitchery that goes with them! My stitching assistant, April Taylor, stitched this for me. 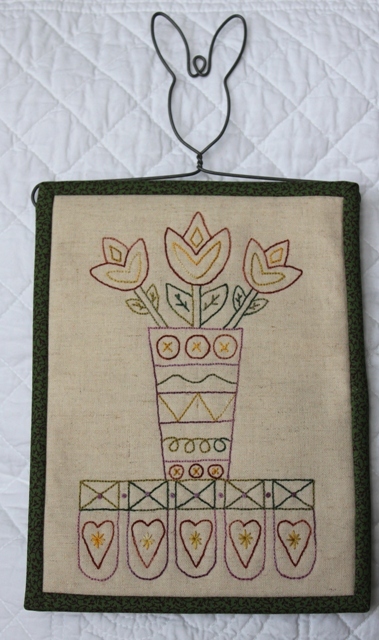 Now my pattern, "For the Love of Spring" is finished and available in my Shop. We also have wool kits! 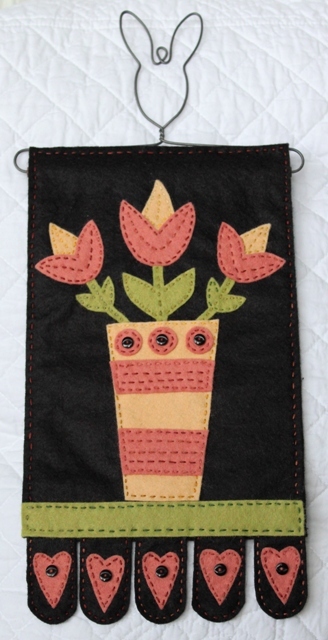 The kit makes both appliques. They are fast and easy to make as they only measure 6"x9". Floss? Yep, we have floss kits too! 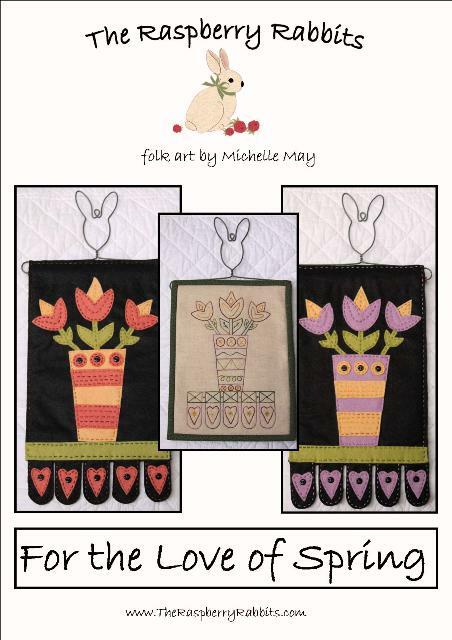 The floss kit will make the stitchery and both wool appliques! Woo hoo! 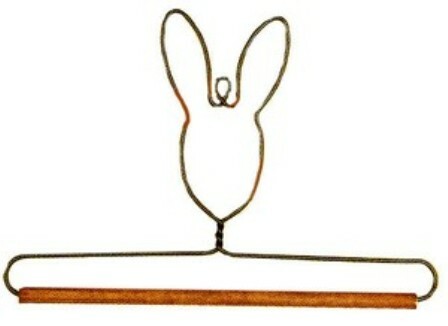 And of course you need bunny hangers! I love these little cuties! Oooooooooooooo how I love Spring! Well that's what I've been working on. What about you? I do hope you are enjoying this tour of the show. I think next Monday will wrap us up. I sure did take a lot of photos! Here we go for this week. 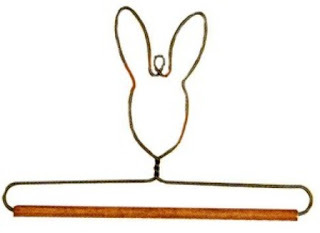 Hop, hop, hop. This quilt is called "Morning Has Broken" by Donna Clauer Stufft of Temperanceville, VA. She won a blue ribbon for it! Of course, look at all that thread painted detail and you can see why! Fabulous! Next for all my bird loving friends, this one is called "Avian Addiction by Judy Loope. (not sure where she is from as it wasn't listed on the tag). This one is called "Light at the end of the tunnel" and was made by Becky Ray of Johnson City, TN. This was a group quilt made by the Tidewater Quilter's Guild, but the main two people of the quilt were Betts Werbiskis for design and Lisa Burgess for quilting. It's called "Celebration of American Life." It was huge! My critter quilt for this week is this fabulous turtle quilt called "Jelly Snacks!" It was made by Kathy McNeil of Tulalip WA. Being the coffee addict that I am, I totally loved this quilt called "Coffee" by Beth P. Gilbert of Buffalo Grove, IL. 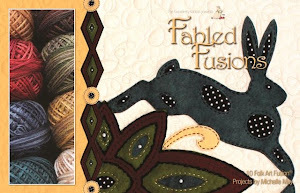 Finally this week, I bring you masks that were made by fiber artists and weavers. I was told the members of their guild got together one day and just started making these felted masks of themselves! How fun! They said they had the best time creating them! However, what really made me smile BIG was while I was standing there admiring all their work, a sweet young gal came up and asked about weaving. The guild member told the gal to sit down and she began explaining how to weave. I smiled big because I was sooooooooo impressed that someone so young was interested in something that wasn't electronic and required the use of hands and not just thumbs! So which was your favorite this week?